Detroit may be the center of the automobile manufacturing world, but when it comes to customizing vehicles Southern California is the heart of the car culture. From "pimped rides" to drag racing, it all started in So Cal. Rockcrawling is strong in Southern California as well, with places like the Hammers and Big Bear nearby. Given the culture, it is no surprise that the annual Off Road Expo is a huge hit. Now in its eighth year, the event is held at the Fairplex in Pomona at the same site used for the Los Angeles County Fair. Just as So Cal embraces anything and everything to do with wheels, the Off Road Expo seemed to have� well, just about everything. In addition to the over 300 vendor booths, there was also a RockCross event, Bully Dog's dyno competition, SCORE and WE Rock press conferences, an FJ Cruiser ride-and-drive, on-site vehicle buildups, freestyle motocross, and live music. About the only thing that we didn't see were midgets juggling chainsaws. 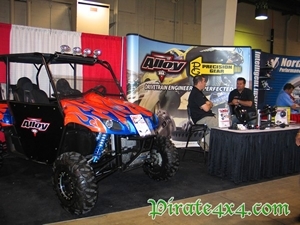 Running only Saturday and Sunday, many of the 40,000 people in attendance hardly had a chance to scratch the surface of all the activities available at the Off Road Expo. 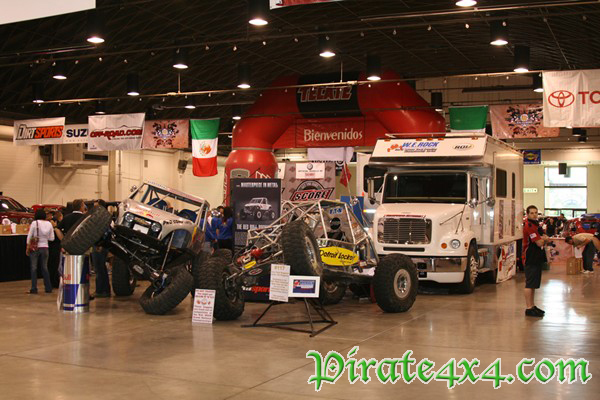 More importantly, Pirate4x4 barely had time to photograph half of the scantily clad women found throughout the Fairplex. The weather was hot all weekend, so while girls in Denver and Chicago were bundled up in parkas, the So Cal hotties spent the fall weekend in tank tops and mini-skirts. As with last year's SEMA show, JKs and FJ Cruisers continue to be the hottest vehicles on the market. Toyota capitalized on this by bringing their Trail Team out to give rides and spotting advice on a manmade course at the back of the 25 acre Fairplex. The FJ Cruiser activities were held next to the manmade courses erected by UROC for their second RockCross event of the season. The RockCross generated a lot of interest, but would have likely benefited from a larger crowd if it was held in a more conspicuous location. The same could be said for the Bully Dog Diesel Dyno challenge. The dyno competition was held at the south end of the Fairplex, in front of one of the eight exhibit halls used for the show. Numerous diesel trucks made pulls on Saturday, with the top torque figure being 860 foot-pounds. 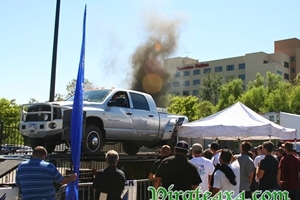 Sunday saw the big dogs come out to play, and at the end of the day George Wadeson walked away with $1000 cash and Bully Dog products for his '06 Dodge Mega Cab after putting down 1171 foot-pounds of torque to the rear wheels. Live action was not limited to the Diesel Dyno challenge. GM Performance Products had a crate engine on an engine dyno making pulling through open headers, and there was a freestyle motocross exhibition behind the Maxxis booth. Two RC car courses were also erected on site at the Fairplex. Perhaps the coolest action we saw though was the live buildup in the Pro Comp Tires area. 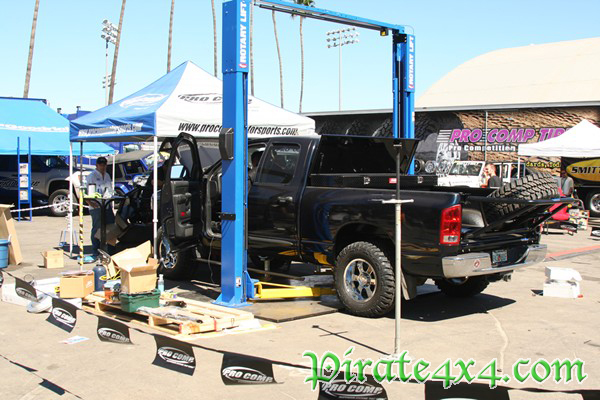 Pro Comp organized the buildup of a Dodge pickup and Toyota Tacoma right onsite at the Expo. The vehicles belong to Marines stationed at nearby Camp Pendleton. Both Corporal Christopher Glugla and Sergeant Richard Massimino were injured in Iraq while serving their country. Pro Comp, Mastercraft, ARB, Warn, Magnaflow, Warn, and 4Wheel Parts stepped up to outfit these Marines' trucks as a small token of appreciate for their service, and the companies did it live in front of the audience at the Off Road Expo. Being so close to the desert of Southern California, the show was heavy on fiberglass fenders, triple bypass shocks, and racks of HID lights. Yamaha Rhinos and similar side-by-sides also seemed to be hot at this year's Expo; we witnessed several Rhinos with custom paint and suspensions that easily cost tens of thousands of dollars. Even with all of the go-fast goodies, there were plenty of rockcrawling companies and components making their presence known. Spidertrax had one of the best booths that we saw, with a display that highlighted the axle building process from start to finish. 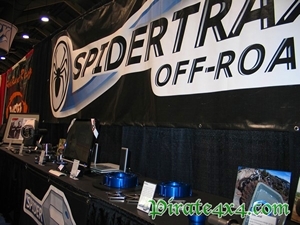 Stak, Poly Performance, Advance Adapters, Powertank, Trailready, Poison Spyder Customs, Warn, and PRP were some of the well known rock-centric companies displaying their products and offering discounts at the show. 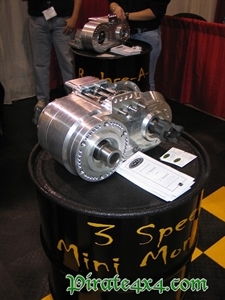 Stak had their new "mini monster" on display, which still offers three speeds, but comes in a smaller package for less weight and easier fitment. Speaking of less weight, American Racing unveiled a new forged, one piece beadlock rim with their proprietary Teflon coating. 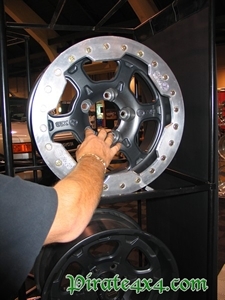 This light weight, strong, good looking rim looks to be the rim to beat right now. The major tire companies were all represented too, with BFGoodrich, Toyo, Maxxis, Interco, Nitto, and Goodyear all onsite with semi trucks in tow. 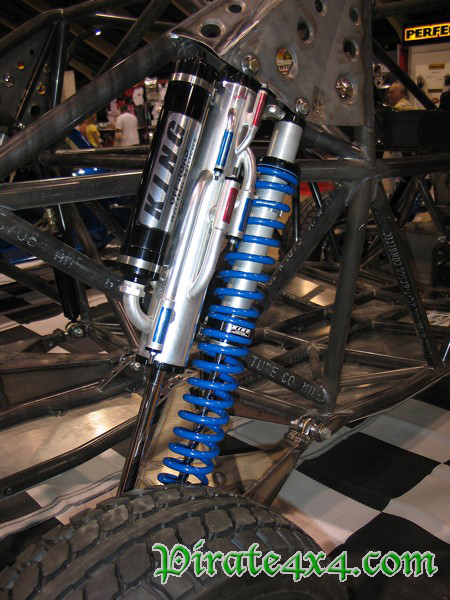 BFG had their new Mud Terrain KX on display in their booth on Don Campbell's beautiful FJ40 Land Cruiser. The new 42" tires were mounted on even newer 20" Walker Evans beadlock rims. Mount Logan Off-Road had a four door JK in the BFGoodrich booth sporting the new Mud Terrains as well, in a 40" size. It seemed like few other innovative rockcrawling products were debuted at the show. We don't know if that is because there was just too much to see in two days or if manufacturers are planning to unveil their new creations at the SEMA show, but we will find out next month when Pirate4x4 heads to the bright lights of Las Vegas to cover the largest automotive tradeshow in the world. 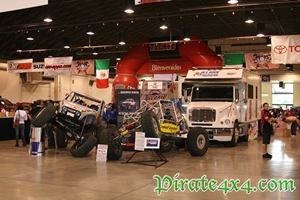 In the meantime enjoy the photos from the Off Road Expo.